Nigel Jaquiss reports in today’s Willamette Week that Nike, PGE and other large Oregon corporations are funneling money to oppose two tax measures on the ballot in January through the Portland Business Alliance and Associated Oregon Industries. PPS School board director Pam Knowles recently resigned as Chief Operating Officer of Portland Business alliance after five years there. 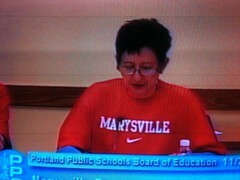 Nike is a long-time corporate partner with PPS, as evidenced by ubiquitous Nike “swooshes” on school district property. Earlier this week, school board members sported Marysville shirts at their meeting to show solidarity with the recently displaced school community. Prominent on the shirts was a Nike logo. If Nike were serious about supporting schools, they would take a stand for re-balancing corporate and individual taxes in Oregon, skewed against individuals and in favor of corporations for at least 20 years. But paying taxes doesn’t provide branding opportunities.